In a culture driven by sexual and racial imagery, very few honest conversations about race, gender, and sexuality actually take place. In their absence, commonly held perceptions of black women as teenage mothers, welfare recipients, mammies, or exotic sexual playthings remain unchanged. For fear that telling their stories will fulfill society's implicit expectations about their sexuality, most black women have retreated into silence. 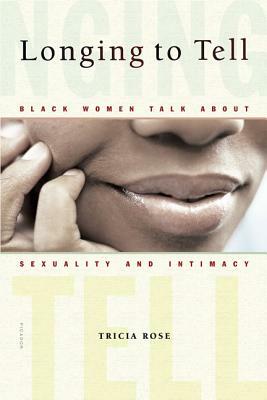 Tricia Rose seeks to break this silence and jump-start a dialogue by presenting, for the first time, the sexual testimonies of black women who span a broad range of ages, levels of education, and socioeconomic backgrounds. Both brilliantly conceived and sensitively executed, Longing to Tell is required reading for anyone interested in issues of race and gender. Tricia Rose is a professor of American studies at the University of California at Santa Cruz. She is the author of Black Noise: Rap Music and Black Culture in Contemporary America. She lives in California. “If Freud called woman 'the dark continent of man,' then the sexuality of black women has truly been the dark continent of the African-American tradition. To read so very much of African-American literature before 1970 is to presume that black women did not experience sexual intimacy, or even discuss it. This pioneering collection by Tricia Rose is as significant to the African-American autobiographical tradition as the depiction of Janie's evolving sexuality in Their Eyes Were Watching God was to African-American literature.” —Henry Louis Gates, Jr.